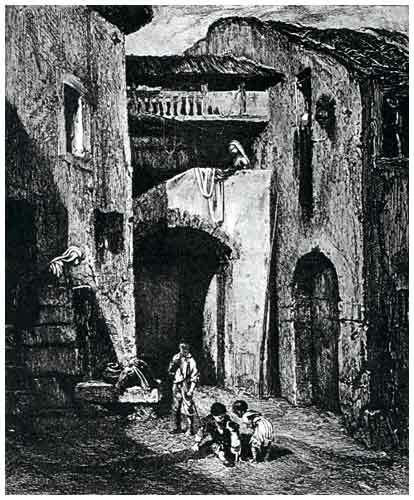 Court-Yard of an Algerian House by Decamp, Part 22 of the Introduction to Art and Artists of Our Time. From the painting by Alexanddre-Gabriel Decamps. ALEXANDRE-GABRIEL DECAMPS was born at Paris in 1803, and died in 1860. He was not one of the leaders of the Romantic movement in theory, although he is counted among its chiefs; his way of painting came to him naturally, in the effort to express his love of wild and savage nature. His childhood was spent in an out-of-the-way part of Picardy, where he was sent by his father, and where he grew up with no companions but the children of the peasantry, with whom he roamed the fields, nutting and birds'-nesting, talking patois, and roughing it, as we say, for three years. This was a good thing in some ways, but bad in others; it unfitted him for life in a city; his manners were uncouth, his distaste for the society of educated people increased as he became more and more aware of his want of fitness for it; but the worst of all was, that he had no love of study, and no power of application; he tried to study with Pujol, but he was unfortunate in his teacher, who proved too indulgent, and incapable of making his pupil see the value of hard work. Decamps left his master, and took up life for himself. He painted a number of small pictures to please himself, sold them, and finding life easy on these terms, henceforth followed the bent of his own inclinations. His early life in the wild country had made him fond of adventure, and soon after leaving Pujol's studio, he set out for Switzerland, Italy, and the Levant. His pictures of the East are those by which he is most favorably known, and one of the best of these, "The Turkish Patrol," formerly in the Johnston collection and afterward bought by Miss Wolfe, was bequeathed by her to the Metropolitan Museum. The picture we copy, "A Court in Algiers," is a good example of his picturesque treatment; but it is essentially as a painter that Decamps lives, and the contents of his pictures are of the least importance. It is altogether the way in which he says things that delights us; so far as accuracy goes, or realism, there is no more of that than is necessary; he caught the spirit, the sentiment of a scene, and no matter how wild or savage the landscape, he reported its aspect with the full imagination of the poet. There are many good examples of Decamps in this country, and no one of the Romantics is moreappreciated here. He was killed by a fall from his horse, while hunting in the forest of Fontainebleau.